Have you been wondering what this sweet smell in the streets of Helsinki during the last days was? It is the smell of roasted coffee. 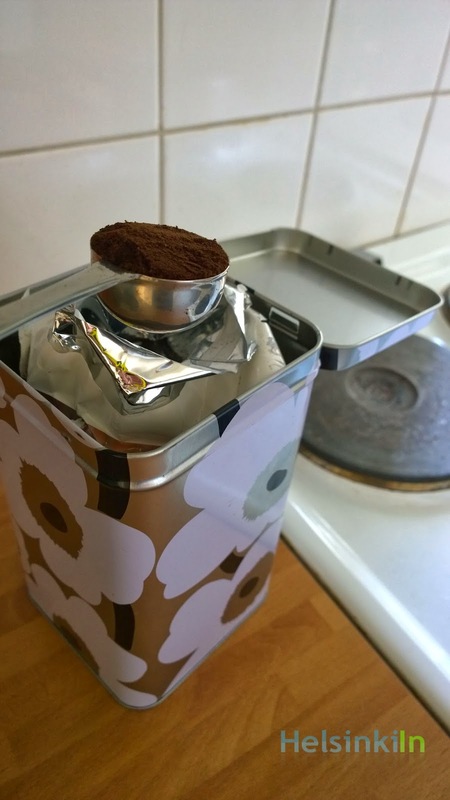 The Kulta Katriina coffee is roasted pretty close to the center in their roasting facility near Pasila. Depending on the wind the smell is carried pretty far and can even still be smelled a few kilometers away. That's pretty good advertisement actually for their coffee, I would say. The days are getting longer and longer now. Did you notice thought that now for already one week the days are again longer than the night? And there is a whole spring and summer still ahead of us. Enjoy the sunshine! 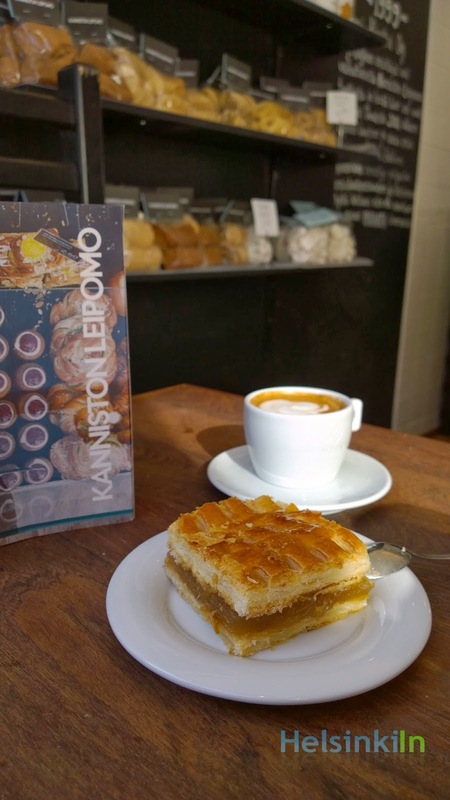 Kanniston Leipomo at Lasipalatsi is one of the oldest bakeries in Helsinki. And no doubt also one of the best. This year they celebrate their 100th anniversary. Kannisto has several locations throughout the city. The most central one is the one at Lasipalatsi. It is very easily overlooked since the place is really small. But it's really worth a visit. Kannisto has lots of good bread. But of course also really delicious pastry. If you are lucky you can catch one of the two small tables at the window and enjoy your sweet treat there together with a cup of really good coffee. Kanniston Leipomo is a real gem and popular among locals. Give it a try! You are a fan of Jazz? And of good wine? Then today is your day. 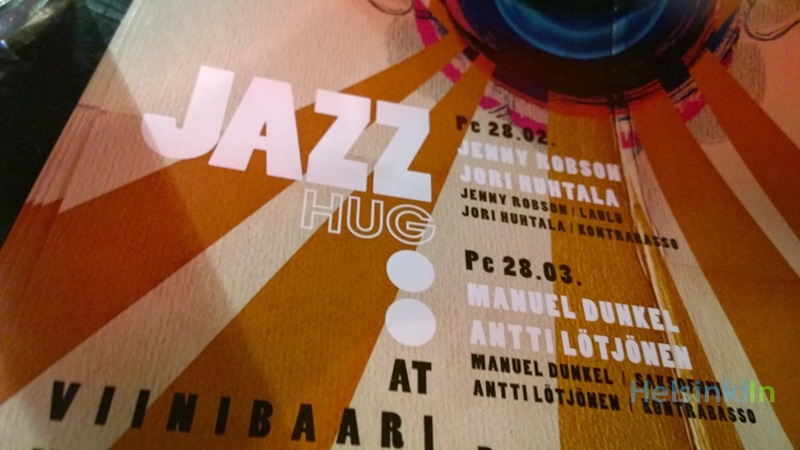 The Vin Vin bar in the center of Helsinki has it's monthly Jazz Hug gig tonight. Manuel Dunkel (sax) and Antti Lötjönen (bass) will be jamming tonight and will get you into the weekend mood. Enjoy a glass of excellent red or white wine and lean back in one of the big arm chairs or sofas while enjoying the music. The entrance is of course for free. Have a great and relaxed weekend! 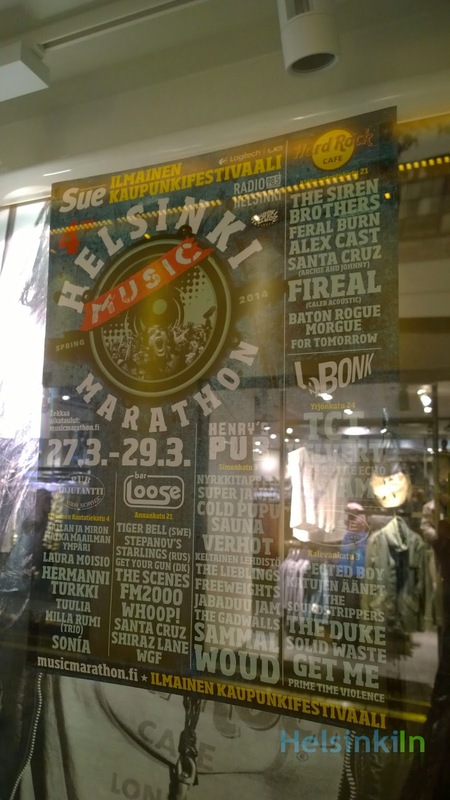 The Helsinki Music Marathon starts today. 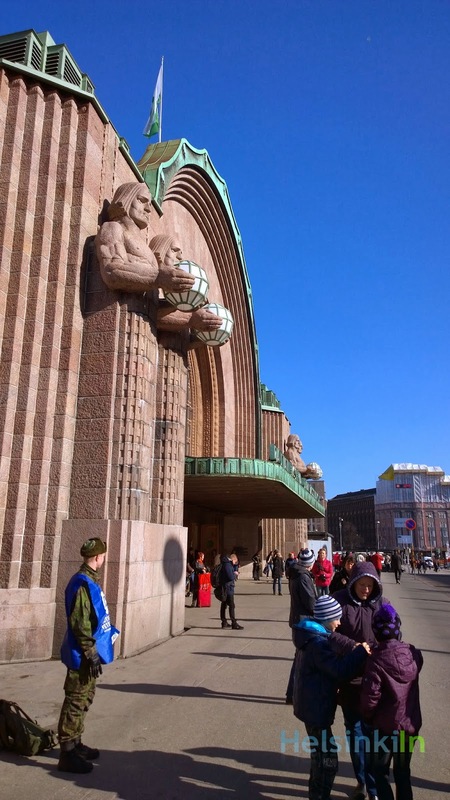 It is one of the first music festivals of the year in Helsinki. And the best thing is that it's absolutely free. On stages in six different bars and pubs around town dozens bands will perform for three days (until Saturday). The gigs take place at Henry's Pub, Bar Loose, Base Bar, Hard Rock Café, Le Bonk and Pub Adjutantti. To see the whole program and find out who performs where and when check out the timetable from the official website. You might have seen them, read about them here or maybe used them yourself already. The KutsuPlus mini buses from HSL get you exactly where you need to go for very reasonable rates. Now the service got even better through extended operating hours. KutsuPlus is the perfect alternative to taking a taxi. And now they even operate late. 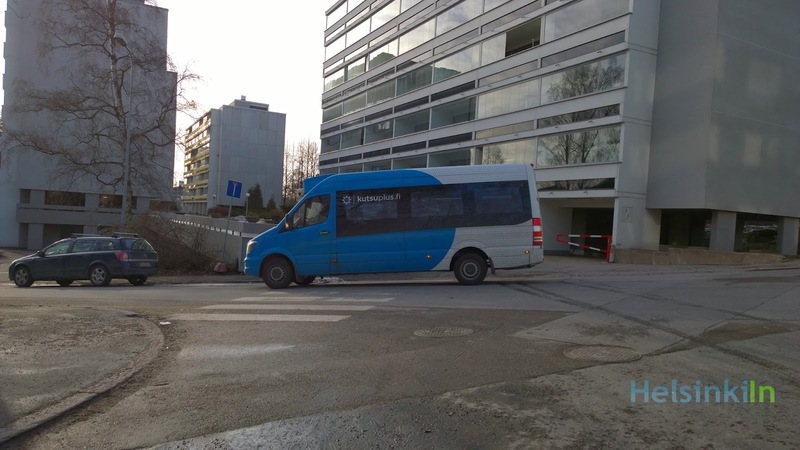 Till 23.00 you can use the KutsuPlus service all over Helsinki and the capital area. Find out more about the bus on demand service from the KutsuPlus website and subscribe now. It's a really great service. What would you be called if you were a Finn? 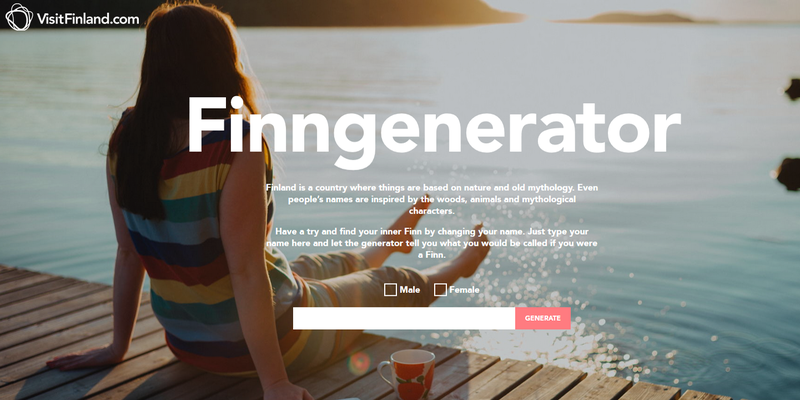 The Finngenerator from VisitFinland.com can tell you. Just type in your name and let them know if you are male or female and you will find out. The web app that is going viral at the moment also tells you what your Finnish name means. Try it out and share the result with your friends on Facebook or Twitter. You can also download it as a picture in case you were planning on putting it up on the wall. Now I also finally made it to the new Starbucks in the center of Helsinki. Many Finns have waited for the opening of this place for a long time. 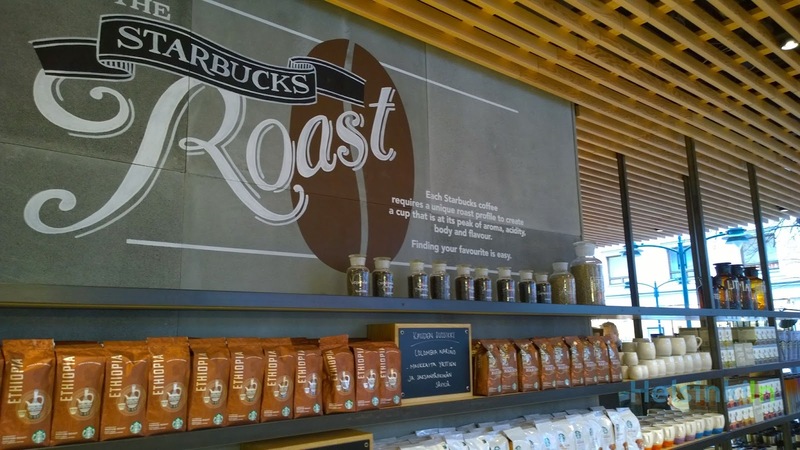 Now Starbucks coffee can be bough right in the center of Helsinki at Akateeminen. And even tough the café already opened several weeks ago you still have to wait in line for quite a while for your coffee. At least during the weekend. The place is especially popular among teenagers. And no doubt Starbucks Helsinki is a really nice place with lots of seat at the big glass windows in one of the best locations in town. It is cozy with the well known Starbucks style you know from other places around the world. And of course the selection is also pretty much the same as anywhere else. Prices might be slightly higher than what you are used to through. All together it's a nice place to go to. If you are planning on going try it during the week and avoid the weekends. At least for the next couple of months. Before waiting in line for half an hour or more rather support one of the local businesses such as La Torrefazzione and get an even better coffee with way less of a hustle. After their long absence it's good to see the Lantern Men back on their posts. During beautiful spring weather their are overlooking the city again. Today it's all about street food in Helsinki. During Streat Helsinki you find lots of amazing food stands around the city from all over the world. Maybe you want to go for some hearty am American burgers or sandwiches, maybe it should rather be some sweet French crêpes and savoury galettes or maybe some street food from Cape Town. All those things and more can be found today at Torikorttelit next to Senate Square and at Teurastamo. 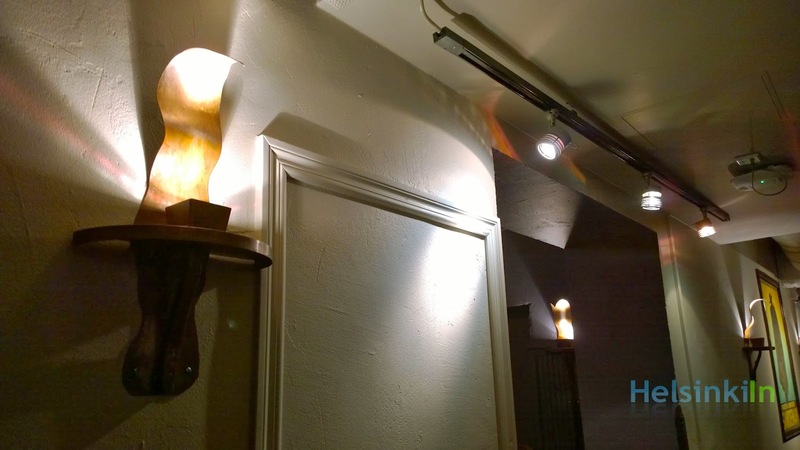 At some later hour in a bar or pub the light might suddenly go off - just for a second. More mysterious even that this happens all over Finland all the time. A phenomenon that has to be explained to foreigners. Well, when I arrived to Finland and first encountered the light sign I really though there was a power cut or something similar. But this is just the normal way in Finnish bars and pubs to show that the last round just started. After that you still have half an hour before the place closes. Soon after the light sign the music will be turned off and the ugly bright lights will be switched on. Have a nice evening and enjoy the time till the light sign! According to the weather forecast today should be the last day with temperatures below zero. 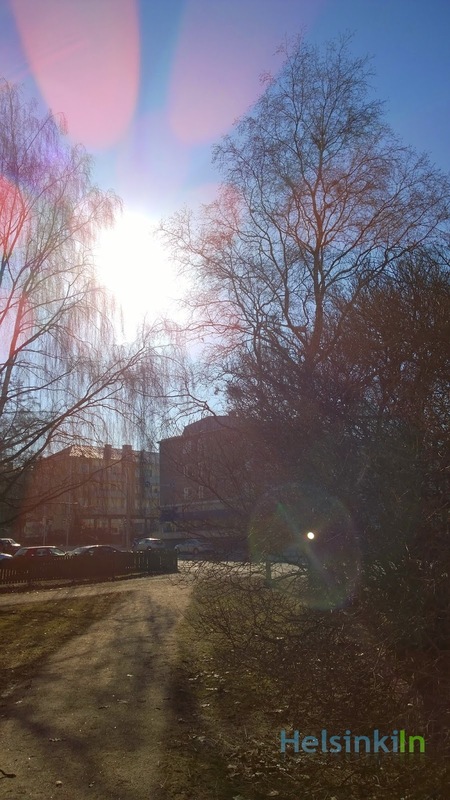 Starting from tomorrow we can look forward to milder spring weather. For all the winter lovers among you I recommend to go for a walk through the snow and ice today. The sun should be out the whole day. You are looking for some some new tech gadget? You don't have any specific product in mind but would like to pay a reasonable price? 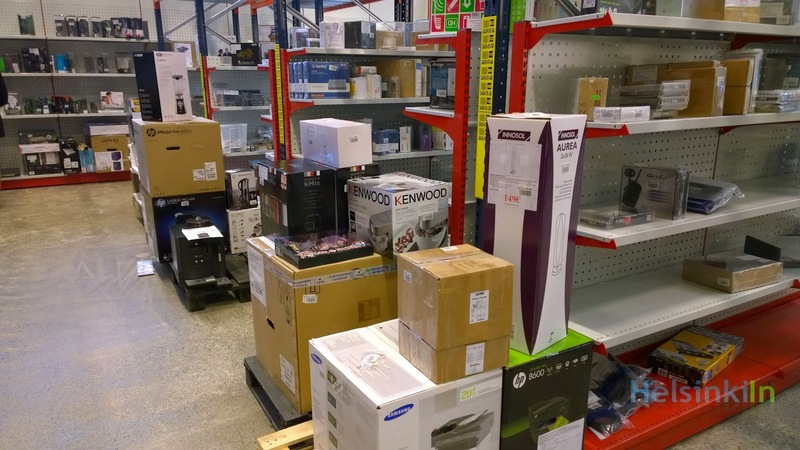 Then check out the reduced products at Verkkokauppa.com in Jätkäsaari. On the third floor in the audio and photo corner you find a corner with shelves filled really good offers. Many products have a damaged wrapping or similar. Technically they are all brand new though and you can save loads here. Get a tablet for around 100 Euros less than the normal price. Or some cables you need for just a few Euros. The items are in no specific order. So you just have to make your way through all the shelves to find what you were looking for. But it might pay off. Check it out and find some really good deals. The miniature golf places in Helsinki haven't opened yet. At least the ones outside since it is still a bit too cold to play. And after all it's more of a summer thing, right? Well, not necessarily. 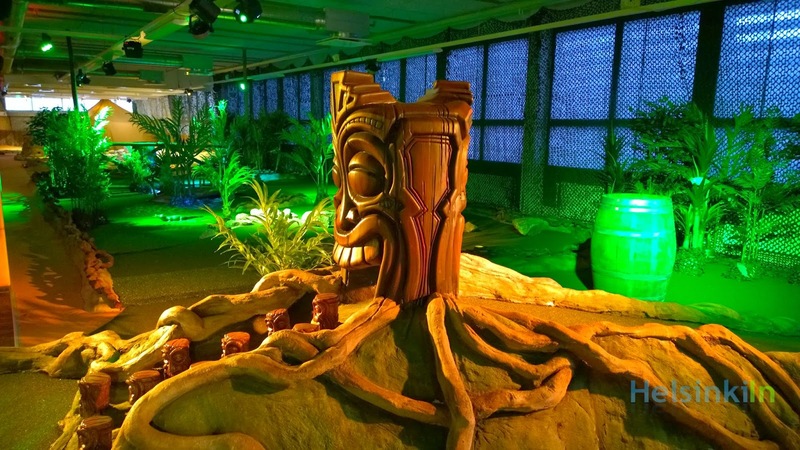 At Salmisaaren Liikuntakeskus a new indoor miniature golf court opened. FunGo has nine tracks with each two holes which gives it the whole 18 hole experience. The low light and the fluorescent colors make an even more special experience. Before or after your game you can make a stop at their small café, sit down and watch others play. FunGo is located on the second floor of the building. The normal ticket for an adult is 14 €. The sun is out but it's still too cold to sit outside. Luckily there are alternatives how you can still sit under the blue sky without the need of a blanket or warm clothes. Forum offer not only one but many options. Their new upper level with several restaurants and cafés is covered by a glass big glass roof. Or just have an after work drink at Apollo and sit in the glass covered court yard. 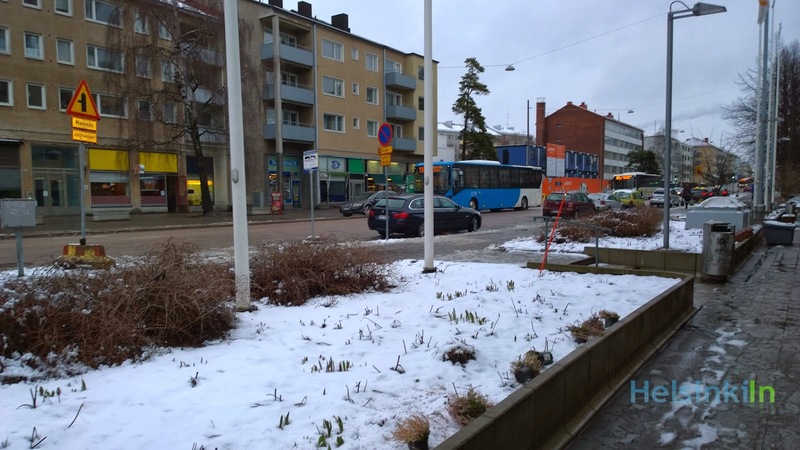 It's probably the weather phenomenon foreigners have the most difficulties adjusting to in Finland: Takatalvi. Takatalvi is the returning winter that comes after there have been already the first warm days of spring like weather. After last weeks warm temperatures with up to 10 degrees winter came back with lots of snow during the weekend. But compared to last years -20 degrees in March this year is still rather mild. 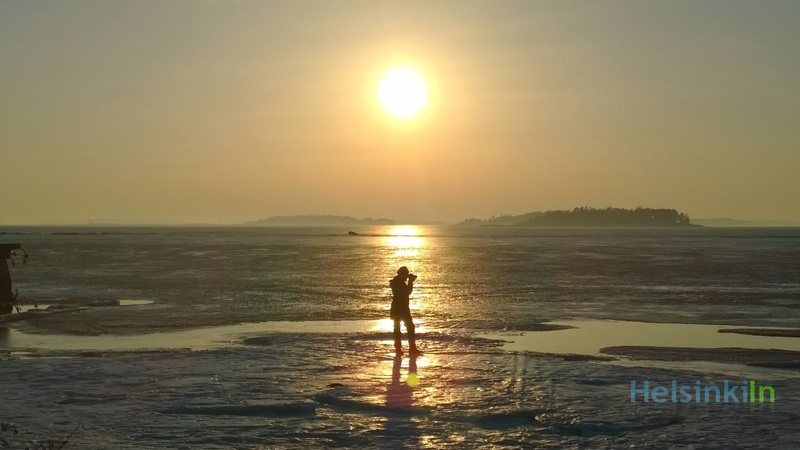 And don't worry, it is just a short cold period before the real spring will arrive in Finland and snow and ice will be gone for good. 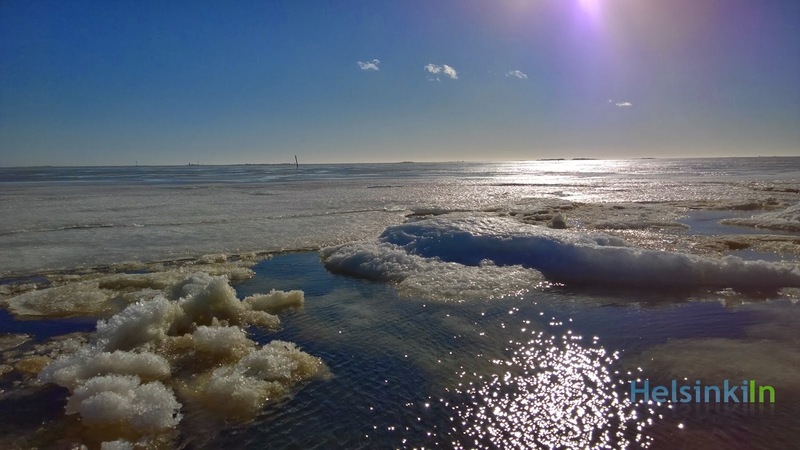 The ice is melting and the sun is out. Can't be long anymore till spring and summer. The picture was taking yesterday though and today the snow came back. But just for a short time, I'm sure. 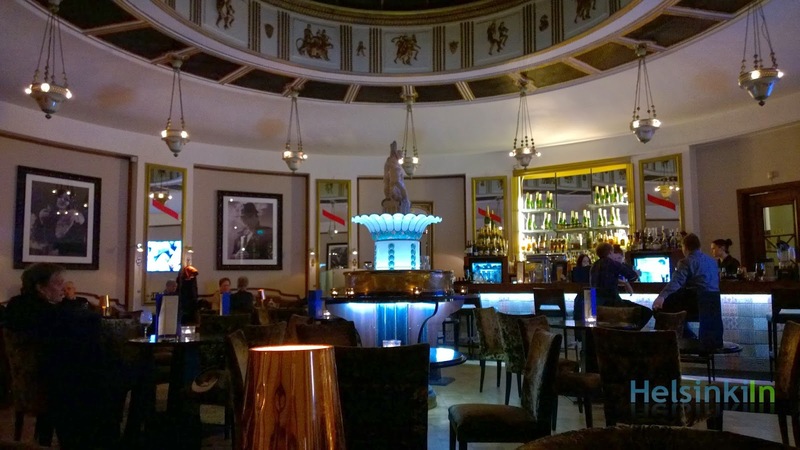 Hotel bars are probably the most underrated bars in cities. Even if their might actually be quite nice. Helsinki also has a few of those hidden beauties. One of them is Bar Socis inside Hotel Seurahuone. 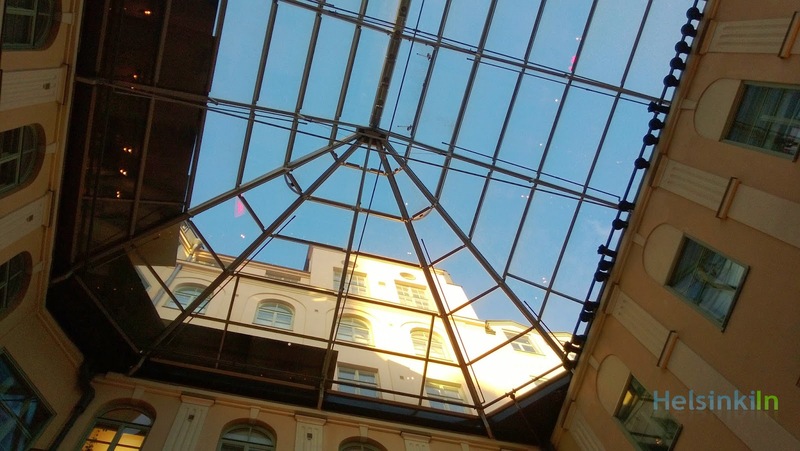 The hotel is located right in the heart of Helsinki next to Sokos and around the corner from the main station. After entering you can already see the bar straight ahead. Bar Socis has a real Paris feeling to it. And that is not just due to the French music played here. The bar has a round shape and is covered by a beautiful colored glass ceiling. The center of the bar is a small fountain covered in blue and green light around which comfortable sofas and armchairs are placed. You can get various cocktails and of course wine and beer here. Prices are a bit higher then elsewhere in the center. The atmosphere is really something though and worth to spend at least an hour. 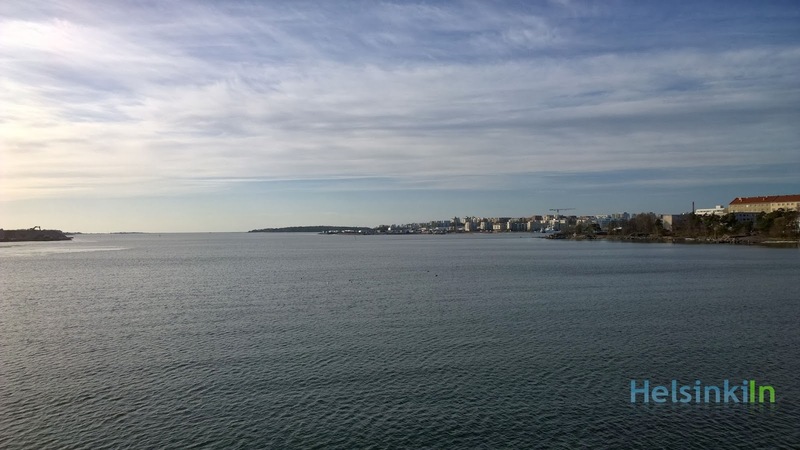 At many spots in Helsinki you can see the sea again. 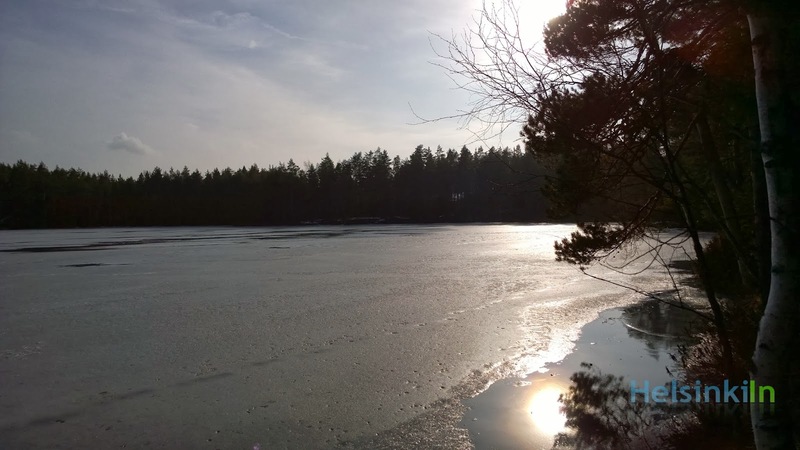 Warm spring temperatures of up to 10 degrees and sunshine made the ice vanish more or less over night. Enjoy this beautiful weather. Unfortunately this was probably not the end of winter yet. At the weekend it should be snowing heavily and the temperatures will drop below zero again. A fresh glass of milk - that's what makes a perfect lunch. Milk being part of lunch seem to be a Finnish tradition. At least for me milk was always a breakfast thing and not really something to drink later. 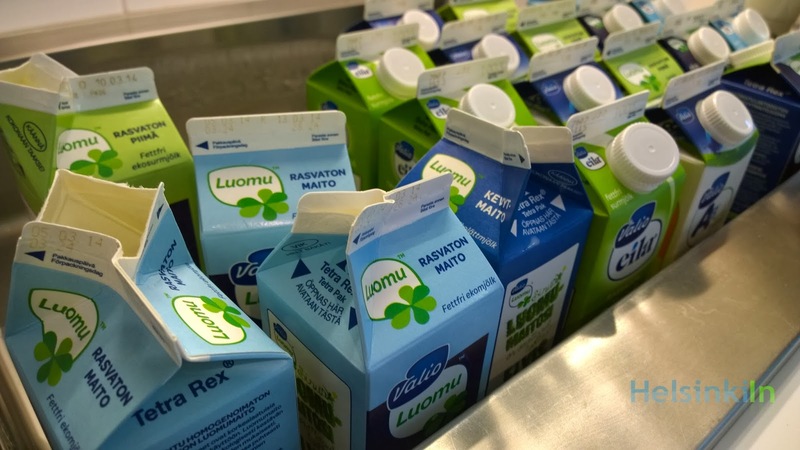 At Finnish canteens you will always find a big selection of different kind of milk (at least low fat and fat free) together with some fresh piimä (buttermilk) though. And it is a great thing to go with a tasty warm meal during your break. If you didn't dare to give it a try yet you should. Have a nice day and a relaxed lunch break. The next days should stay nice and sunny. 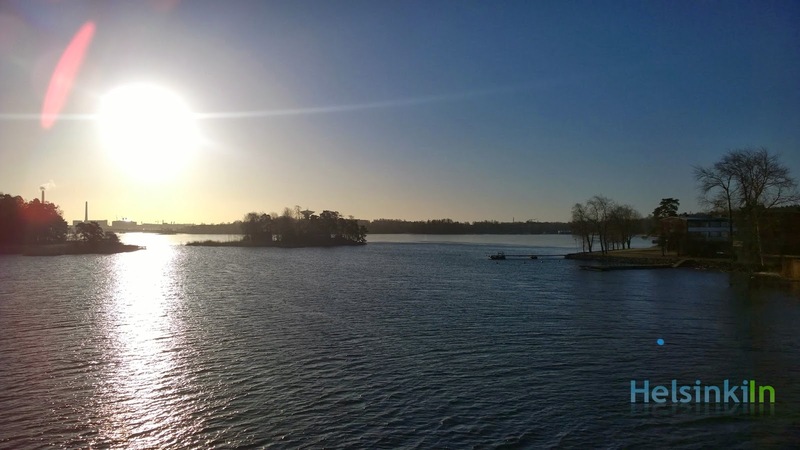 Enjoy the weather with a walk through the beautiful Finnish nature. Like here at Nuuksio National Park. 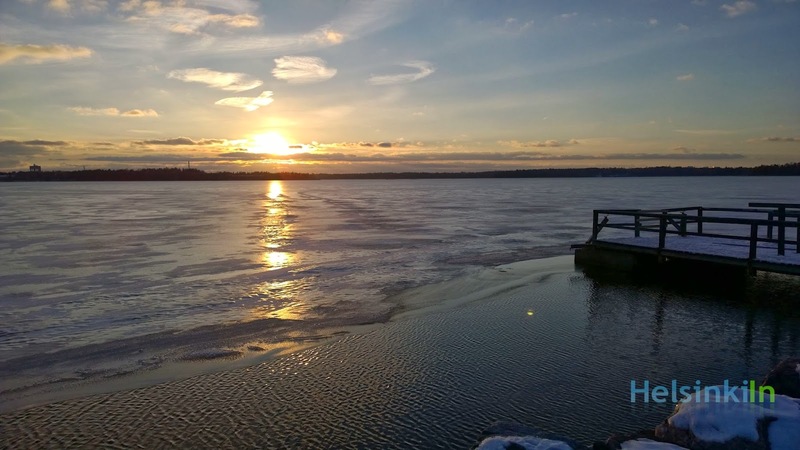 The shore of Helsinki already has the first small ice free spots. What is your guess how long it still takes for the ice to vanish completely? Ravintola Kolo in Punavuori doesn't attract much attention when you pass by on the street. In fact you will even have difficulties to read it's name from the outside or even find out that it's a restaurant. Even if you visit their website you won't find out much about them other than there opening times and address. Nevertheless this small restaurant is probably one of the best in town. Kolo knows how to impress without making much noise about it. The food is served on old dishes that seem to come straight from grandma's cupboard. This along with the size and low-key interior gives the place it's very own atmosphere. But let's focus on the food. The staff at Kolo really know what they are doing. Both the quality of the food and the service are excellent. I highly recommend going with a three course menu to not miss out on their great appetizers and desserts. Try e.g. 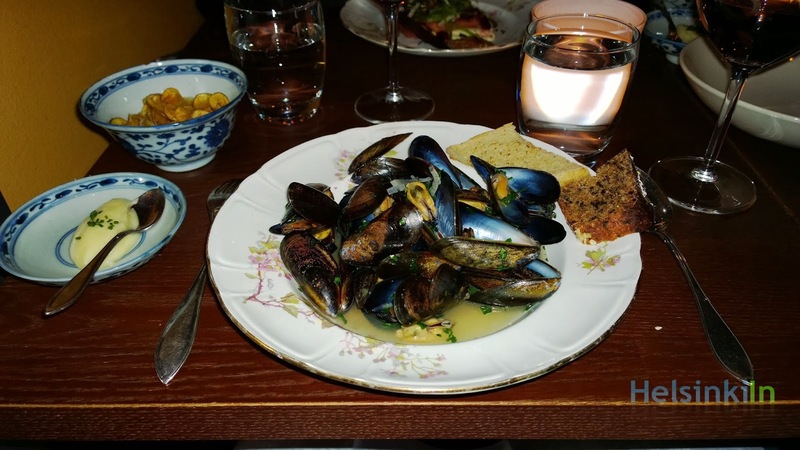 their heavenly mussels with homemade potato chips as a starter, some tasty tiger prawns as a main course and enjoy their delicious brownies together with a cup of coffee. The waiters can give you great wine recommendations. Also consider trying their dessert wine. It's really good. Have a wonderful evening at Kolo! But don't forget to make a reservation before. Today is Naistenpäivä (Womens' Day). It was introduced around 100 years ago to draw attention to gender equality and womens' rights. Finland is not a public holiday but still remembered and celebrated. You will also find special offers for women today in the streets. 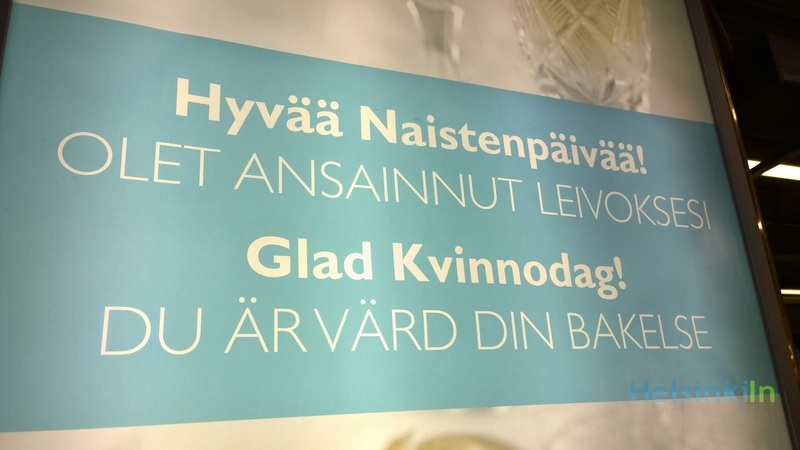 Have a great Naistenpäivää, all the women out there! Would you like to welcome the weekend with a sparkling glass of cava? Then come to Casa Largo in the Sokos building right in the city center. They have a special offer of just 3,50 € per glass. And that not just for Friday but every day of the week. So if you miss it today, don't worries. You should still have lots of opportunities. 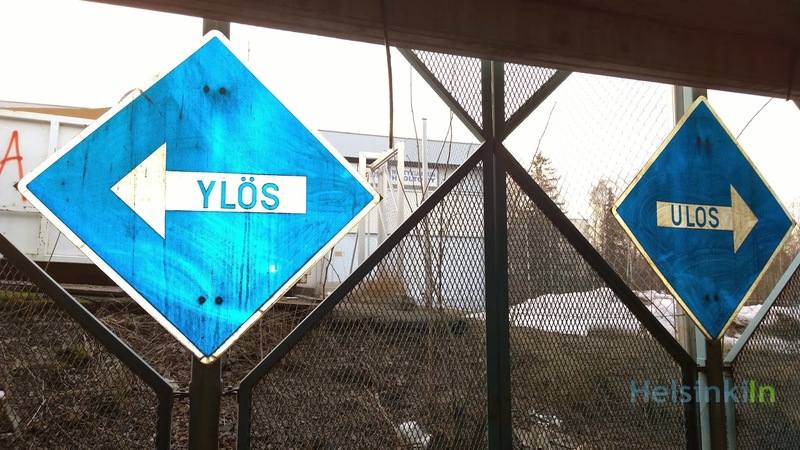 I love those two Finnish signs at a parking lot in Espoo. I always imagine how helpless a tourist might feel here that doesn't know a word of Finnish. What the signs are trying to say is, if you want to go up, go left and if you want to go out, go right. Do you happen to be around Punavouri around the lunch time? 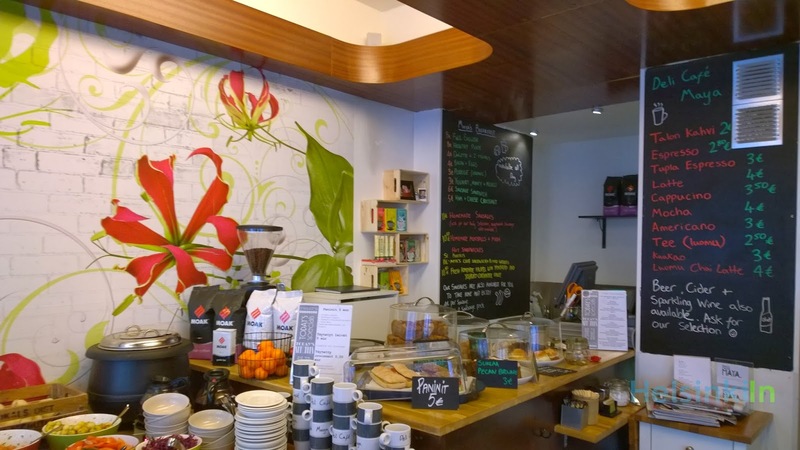 Then check out Deli Café Maya for some really good and delicious food. 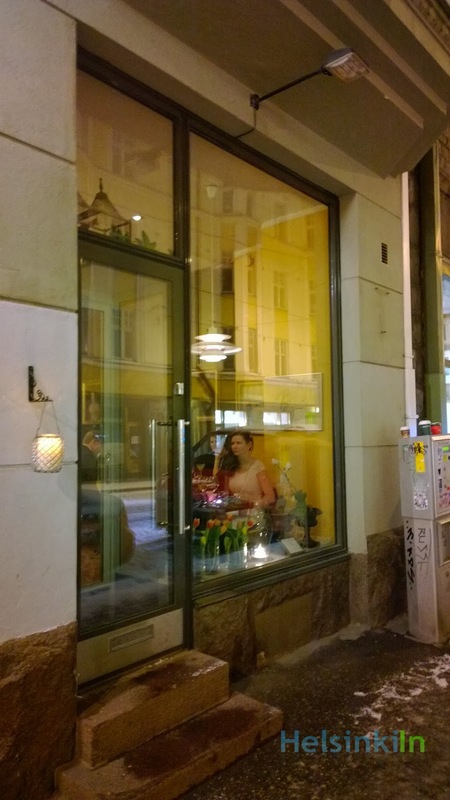 The small deli is located on Punavuorenkatu one blog away from Iso Robertinkatu. It is really quite small and the interior is kept really simple. But Deli Café Maya has everything you need for a good lunch. First you choose your main dish from one of the daily offers. They always have something vegetarian. 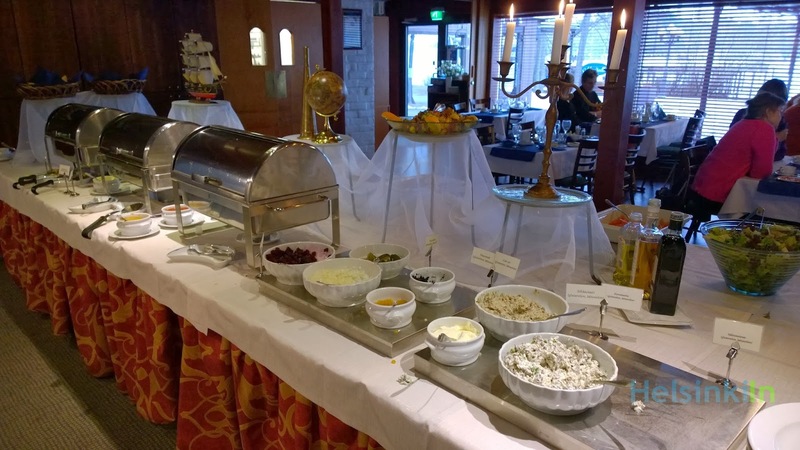 Along with the main dish which is prepared for your and will be brought to your table (quite rare in Helsinki) comes a great salad and appetizer buffet. Also a soup is included. When you're done, take your time for a cup of coffee and maybe a small piece of cake if you like. All included in the price of course. 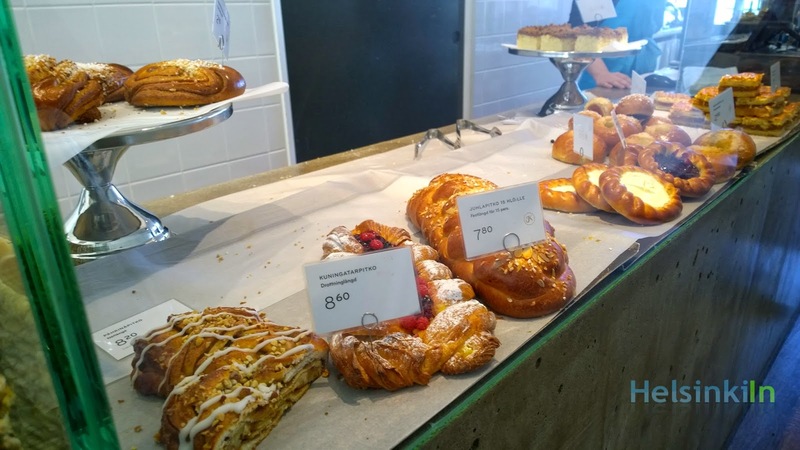 Today is Laskiainen and your last chance to have one of the heavy, sweet and really good Laskiaispulla. 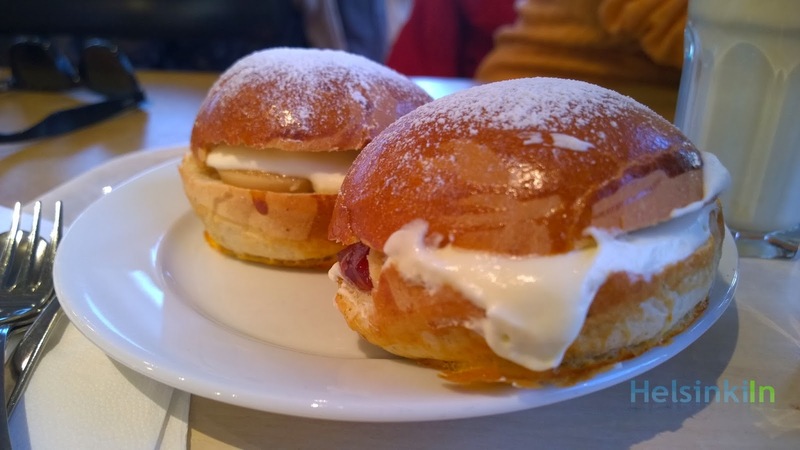 They are buns filled with either jam or marzipan and swipped cream - loads of whipped cream. Go and get one (or maybe two) today and if you have time visit the sleighing competition starting a bit after noon at Kaivopuisto today. The organziers even took care that there is some snow for the event. Tomorrow is Laskiainen (the Finnish equivalent for carnival). 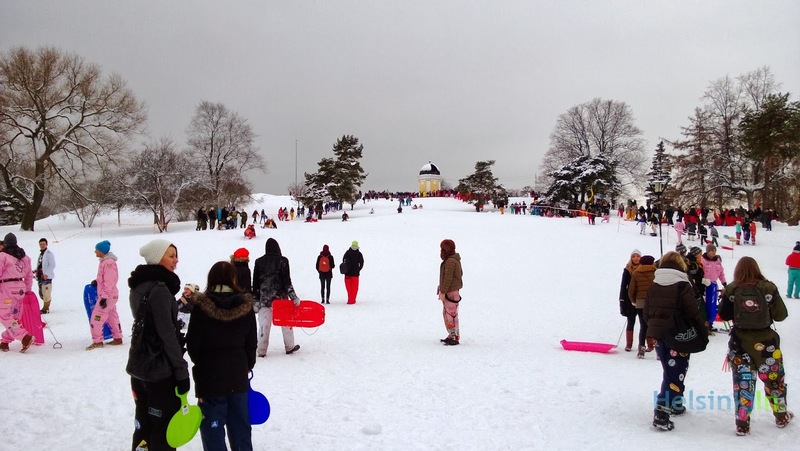 Traditionally students from around Helsinki meet at Kaivopuisto for a sleighing competition. Several groups compete for the best sleigh. This year they definately don't have the best weather conditions for that competition. You can be sure though that starting from around noon students will gather in the park for a big party anyway. And they will most likely come up with a solution to deal with the lack of snow this year. So if you happen to be in the area tomorrow go and check it out. It's always quite an event. Every sunny day during this time of the year is something to take advantage of. So whenever you see the sun, go outside and enjoy it. You might also be able to make some nice pictures. Today is unfortunately not such a day. Have a nice Sunday anyway! What about a nice big brunch this Sunday? And should it maybe be something a bit more traditional this time? Then try Mestaritalli. They have a big Saaristo brunch with lots of nice salads, fish, dark bread, warm dishes like Vorschmack, bacon and sausages. 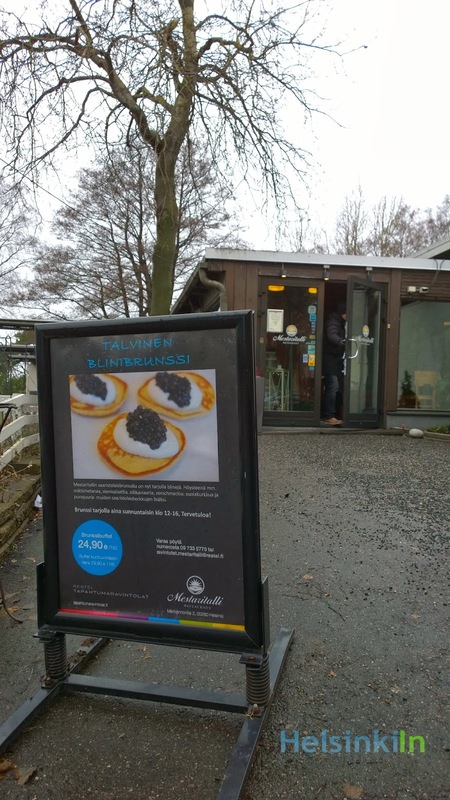 And at this time of the year also blinis are included that can be topped with sour cream, pickled cucumber, fish roe and more. 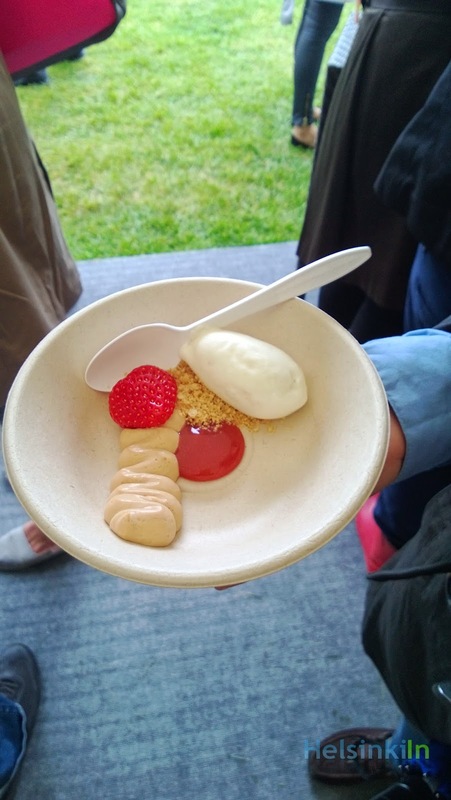 And also leave some space for the delicious cakes, fruits and cookies from the desert table. Mestaritalli also have a really nice location at the sea shore at Seurasaarenselkä. Brunch is served Sundays from 12 till 16.00. To be save call in advance and make a reservation.